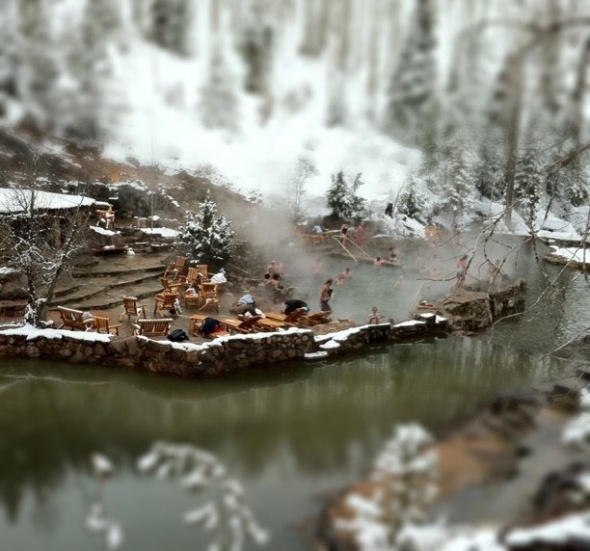 The Strawberry Park Hot Springs seven miles north of Steamboat Springs offers 104-degree mineral water pools in a natural setting on Hot Springs Creek with stone masonry, plus massages in a private hut and watsu therapy in a private pool. It is open to all ages during the day. After dark, clothing is optional, and no one under 18 is admitted. There is a daily fee for use of the springs, plus extra charges for services. Facilities include restrooms, a tipi and heated cabin for changing, and picnic areas. The road to the springs is unpaved, steep, and winding. It requires a four-wheel-drive vehicle or a two-wheel-drive vehicle with chains in the winter but can be reached by car in the summer. Motorcycles and recreational vehicles are not recommended. Parking is limited. Two companies offer shuttles from Steamboat Springs for a fee.